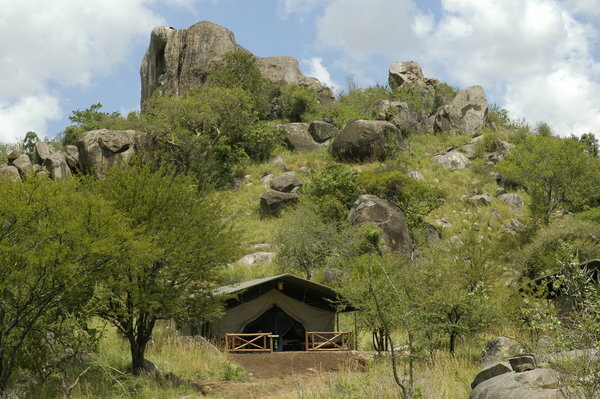 Imagine visiting this camp on your next Tanzania African Safari! Mbuzi Mawe Luxury Lodge located in the central woodlands of the Serengeti National Park. With just 16 spacious rooms under traditional canvas, Mbuzi Mawe provides for a very intimate and authentic safari experience. Each luxury tent is furnished with 2 queen size four-poster beds, ensuite bathrooms and a lovely veranda with an extra large zebra striped sun bed for two. The main lodge is equally charming and consists of a cozy tented lounge and bar, outdoor patio, both indoor and outdoor dining rooms, gift shop and a fire pit. The sleeping tents are situated in a circular formation around the base of the beautiful Kimasi Kopjes while the main lodge tent is set further up a hill allowing for good views. The surrounding topography is one of gentle rolling hills, open acacia tree woodlands and large granite outcrops called kopjes.